Forests and forestry in developing countries are major sources of greenhouse gases that cause global warming, but they are carbon dioxide sinks at the same time. They will suffer from increasing temperatures, but they can also help humanity to adapt to climate change. Land use decisions play a pivotal role in national development. Michael Dutschke resumes over a decade of policy advice. His dissertation starts by focusing the global frameset of forestrelated mitigation activities under the Climate Convention. The subsequent chapters shed light on the diverse underlying methodological and economic issues. The final chapter proposes how to collect funds for tasks of global common interest like the reduction of emissions from forests or supporting adaptation to climate change, while at the same time strengthening the commitment of the beneficiaries towards the international climate regime. Dutschke concludes that forestry is special compared to other sectors, and that environmental risks in striking the balance between environmental effectiveness, cost-efficiency and equity are posing important challenges. Besides identifying the key issues in climate forestry, he offers pragmatic solutions for the integration of forests in international climate policy. Michael Dutschke (Germany, 1959) studied political sciences at the Universität Hamburg, and social economics at the Hamburger Universität für Wirtschaft und Politik (HWP). Since 1997 Dutschke is policy advisor in international climate politics. He is first author of the ‘Fourth Assessment Report of the Intergovernmental Panel on Climate Change’, that won the Nobel Prize in 2007 (together with Al Gore). Dutschke will be awarded his PhD in economics and business on 1 April 2010 (1.15pm). His thesis supervidor is prof.dr. 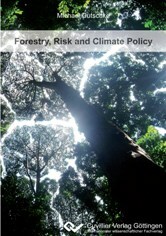 C. Jepma, and the thesis title: Forestry, risk and climate policy.